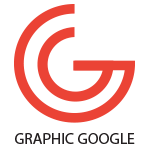 Graphic Google create every graphics with care and love that designers from all over the world love to download. Designers are allowed to use free graphics in a personal and commercial way. You can share them on your website but link back is compulsory.